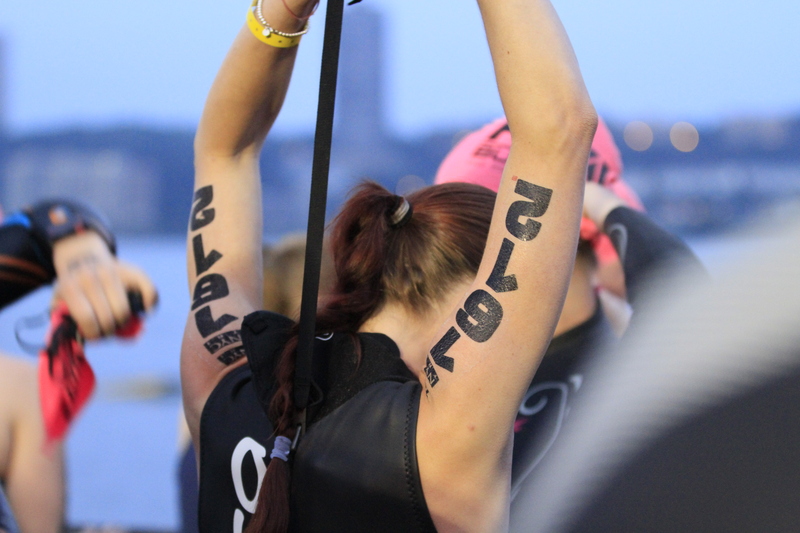 Made for More – Oakley Women’s Mini – Countdown to the NYC Triathlon! Saturday was the 43rd annual Oakley Women’s Mini – a 10k that celebrates women being able to participate in races, which didn’t happen until 1972! Isn’t that kind of crazy? That’s the year that Title IX became a law, which created a ton of more opportunities for women athletes. I was looking forward to this race for weeks and knew I had to run it. As the day came closer, though, it felt like the elements were challenging me to see if I would really run it. Didn’t matter – I was doing it. The 101 degree fever I had a couple days before wouldn’t stop me. The never-ending cough that had been lingering for almost a week wouldn’t stop me. And the crazy thunder, lightning and downpour just about 12 hours earlier wouldn’t stop me. Besides, I had already picked up my race packet and the dark grey racer-back tanks that said “Made for More” in hot pink were super cute and I needed to wear it ASAP! I got to the starting line at 61st and Central Park West feeling as though I had gotten 45 minutes of sleep and practically sleepwalked my way through the nearly 6,000 women who were doing their pre-race preps. Some were stretching, others were running in place. Most were taking selfies, looking at the photo, shaking their heads and then retaking them. I get it though – it’s important to have a good race day photo. I don’t usually do pre-run photoshoots, and then I regret it. Especially after seeing the in-race pictures. Man, those are usually pretty rough. I found my corral – yellow 2000-2999 – and wiggled my way up to the front, getting there just as the opening remarks were starting. There were several famous runners there – including Deena Kastor (Olympian who ran and won the More Fitness Women’s Half Marathon that I did a couple months back), and Lauren Fleshman (awesome runner and co-creator of Picky Bars, which are in my top 3 favorite bars of all time. Sometimes all you need in life is a Smooth Caffeinator or a Blueberry Boomdizzle.). After the remarks a survivor of the Boston marathon bombing spoke. I couldn’t see her from where I was standing, but what she said was short and sweet and got the job done – we were even more ready to run! We had to wait a few more minutes though because they needed confirmation that Central Park West was closed through 90th Street. Ok, finally – the countdown. 3… 2… And the horn sounded – we were off!! I started my Nike+ watch, coughed up a lung, and started up CPW. As I passed the stage I saw the Boston Marathon survivor wearing a cute running outfit and a prosthetic leg. She was so enthusiastic and telling us to have fun as we rushed by her. I tend to have a lot of adrenaline at the beginning of races – too much maybe – and start pretty fast. Problem is, races are relatively slow at the beginning. You have to maneuver your way around everyone in front of you until you and everyone else settle into their paces and spreads out a bit, which is no easy task at times. During this race I was “that girl” – the one who definitely and annoyingly used the curb to get around a ton of people. When I wasn’t doing that I was dodging and weaving through everyone, which had potential to catch up with me later on and I just hoped that I had the energy to keep it up and not pay for it by the end of the race. I would have been more mindful of all that if this had been a longer race or in a different location, but it was “just” a 10k around my park. I had this! 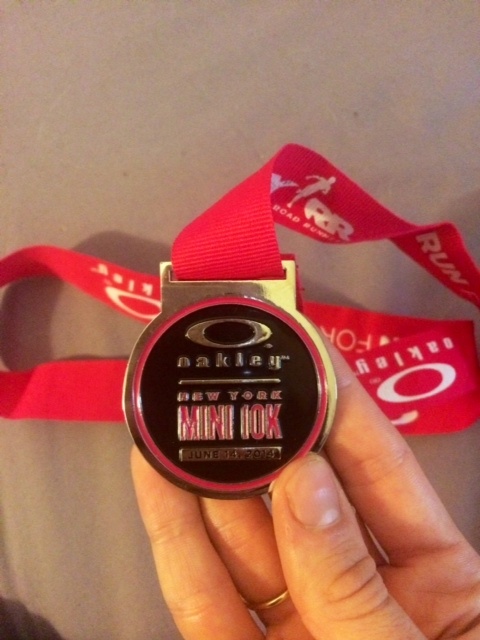 This race was interesting because we ran up CPW and entered the park at 90th Street, and continued in the park running clockwise. 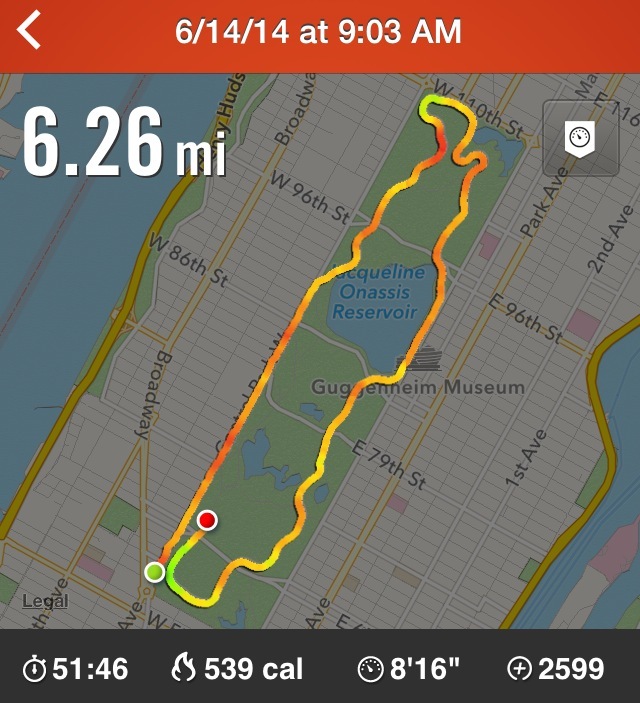 I’ve never run clockwise around Central Park – only counterclockwise. Every single time. It was almost like running in a new place! Running down the Harlem hill was great. Running down the Cat Hill was even better! Don’t get me wrong, there were other hills, but just the satisfaction of not running up those hills – being able to smile at the cat statue instead of glare or grimace at it – made any other hill totally worth it. As I ran and continued to check my watch, I noticed that I was running much faster than expected, so I began to think that it was a perfect day for a personal record. I mean really – what better race than this one, right? And so I just booked it. One of my pals from Muay Thai was volunteering at this race so I made sure to run on the outside when I got near the south part of Central Park, knowing that he would be around there. I found him somewhere just after mile 5.5 and got a big high five from him. “Finish strong! !” he yelled after me as ran off. “Will do!” I promised. After that, I grabbed a Venti unsweetened green iced tea, headed straight for the nearest couch, and considered it a successful Saturday!